Contact lens wear can significantly reduce your dependency on eyeglasses, provide hassle-free vision correction, wearing non-prescription sunwear and goggles, or the convenience of not having to worry about misplacing your glasses. If you have a high prescription or astigmatism, contact lenses may provide more enhanced vision correction than glasses. The first step is a comprehensive eye examination, followed by a contact lens fitting by our licensed staff optometrists. There are a great many choices of lenses available to you. ​We carry all major contact lens brands and fit a wide array of lenses including disposable, planned replacement, toric and bifocal, dailies, and colored contacts. It is important to consider your present visual needs (work, outdoor activities, hobbies, etc). Astigmatism? You CAN wear contacts!! Astigmatism occurs when the front surface of the eye (the cornea) is slightly irregular in shape. 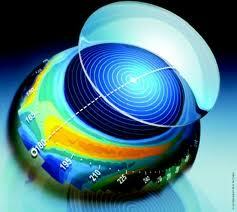 Recent advances in lens designs now enable people with astigmatism to wear what are known as toric contact lenses. ​Both soft and RGP (gas permeable) contacts are available to correct astigmatism. Contact lenses are a medical device, and are, therefore, controlled by the FDA. 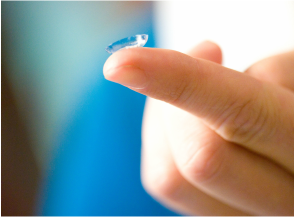 ​Typically, contact lens prescriptions expire in one year and require annual checkups with your eye doctor. Fitting for the ideal lens to insure the best comfort and optimal vision begins with your initial contact lens evaluation. After the necessary measurements and careful consideration of your visual needs, your eye doctor will typically dispense a set of trial contact lenses. ​The typical fitting process takes one to two weeks, or longer if necessary. Once your fitting is completed, you are dispensed your final contact lens prescription. In the office you will practice inserting, removing, and how to practice safe care and usage of your new lenses. ​Should further time be required, we will be happy to schedule an additional session (without charge). These lenses combine the high precision optics of rigid custom gas permeable lenses in the center along with an outer soft edge for comfort. A new generation of soft contacts that are“super-permeable” to oxygen, which is critical to the health of the cornea. These types of contacts tend to be better suited for “dry eye” patients who are often intolerant to various contact lens materials. Looking for an alternative to LASIK surgery?? Orthokeratology, or Ortho-K for short, is an FDA approved corneal refractive therapy involving the use of a custom-fit gas-permeable contact lens to temporarily reduce nearsightedness. This is a safe, reversible corneal reshaping process that takes place while the patient sleeps. It is both efficient and non-surgical. Ortho-K is an excellent option for both children and adult patients who meet the initial fitting criteria. Always wash your hands before handling contact lenses. Carefully and regularly clean contact lenses, as directed by your optometrist. If recommended, rub the contact lenses with fingers and rinse thoroughly before soaking lenses overnight in sufficient multi-purpose solution to completely cover the lens. Store lenses in the proper lens storage case and replace the case at a minimum of every three months. Clean the case after each use, and keep it open and dry between cleanings. Only fresh solution should be used to clean and store contact lenses. Never Re-use old solution. Contact lens solution must be changed according to the manufacturer's recommendations, even if the lenses are not used daily. Always follow the recommended contact lens replacement schedule prescribed by your optometrist. Avoid tap water to wash or store contact lenses or lens cases. Use cream soaps. They can leave a film on your hands that can transfer to the lenses. Use homemade saline solutions. Improper use of homemade saline solutions has been linked with a potentially blinding condition among soft lens wearers. Put contact lenses in your mouth or moisten them with saliva, which is full of bacteria and a potential source of infection. Use tap water to wash or store contact lenses or lens cases. Use products not recommended by your optometrist to clean and disinfect your lenses. Saline solution and rewetting drops are not designed to disinfect lenses.